Welcome race fans who like the taste of clay in their teeth, who like to blow mud out of their noses!! 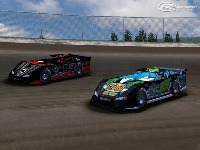 If you are missing that "factor" in your life, then you need diRtFactor Late Models!! One of the few dirt racing mods for rFactor that has taken nearly a year to develop, and believe me it was not due to lack of work. Every detail has been gone over, then over again to bring you the NEXT Generation in Sim Racing. Our goal is to blur that line between real and sim racing. It is a fine line to walk in this genre of racing. Too easy and you lose players, too hard same outcome. With the final release we were shooting to appease as many driving styles as possible. We know that no matter what you do, someone will find something negative to say. We wont make everyone happy all the time, but our goal is to make the masses happy as much of the time as possible. How come everyone is getting errors with sounds, textures, etc, when I have no problem at the mod? lol!